Question 1. What happens to the resistance of circuit if current through it is doubled ? Question 2. The work done in moving a unit positive charge, across two points in an electric circuit is measure of _____ ? (d) Smaller resistor has less conductance. Question 4. Ohm's law relates potential difference with ______? Question 5. Two bulbs marked 200 watt - 250 volts and 100 watt-250 Volts are joined in series to a 250 Volts supply. Power consumed in the circuit is ____? Question 6. 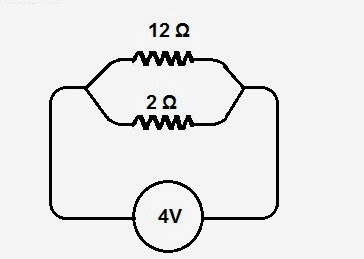 In what combination, the 3 resistors of 3 Ohms each should be connected to get effective resistance of 1 Ohm ? Question 7. Two light bulbs are marked 230 V- 75 W and 230 V - 150 W, if the first bulb has resistance R, then the resistance of second is __ ? Question 9. What should be the resistence of a Voltmeter ? Question 10. Three equal resistors, when combined in series gives an equivalent resistance of 90 Ω. What will be their equivallent resistance when combined in parallel ? Question 12. Which property of electricity is responsible for use of fuse wire in household wiring ? Question 4. A voltmeter is used for measuring the electric current in the circuit. Question 6. One volt is a potential difference between two points in current carrying conductor, when 1 joule of work is required to be done, in moving 1 coulomb of charge from one point to another. Question 10. In an electrical circuit, potential difference (V) across the ends of given metallic wire, is inversely proportional to current flowing through it, provided its temperature remains the same. This is called Ohm's law. Question 12. In an electric circuit, the direction of the flow of current is from negative to positive terminal of the electrical cell. Question 13. The filament of an electrical lamp is heated to such a high temperature that it starts glowing. Question 14. The ammeter reading is reduced to approximately one half when length of the wire in the circuit is doubled. Question 15. The process of depositing layer of any desired metal on another material by means of electricity is called electroplating. Question 19. When electric current is passed through copper sulphate solution, the copper gets transferred from one electrode to other. Question 20. Electrical current can pass through glass sheet. Question 22. Conventionally, in an electrical circuit, the direction of electrical current is taken in the same direction as the flow of the electrons, which are negatively charged. Question 25. In order to maintain the electric current in the given circuit, the electric cell makes use of mechanical energy stored in it. Question 26. ρ (rho) is a constant of proportionality and is called the electrical resistivity of the material of the conductor. Question 29. The voltmeter is always connected in series across the points between which the potential difference is to be measured. Question 30. The ammeter reading is increased when a thicker wire of the same material and of the same length is used in the circuit. Question 31. When more than one cell is connected to each other, the combination is called a battery. Question 33 Chromium plating is done on many object, because it has shiny appearance, it does not corrode, it resists scratches. Question 34. 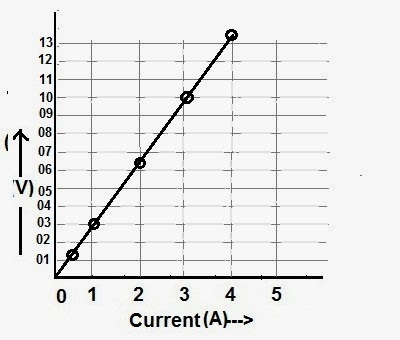 Total potential difference across a combination of resistors in series is equal to the sum of potential difference across the individual resistors. Question 2. Which of the following terms does not represent electrical power in a circuit? Question 5. How is a voltmeter connected in the circuit to measure the potential difference between two points? Answer. Voltmeter is connected in parallel in the circuit to measure the potential difference between two points. Question 6. A copper wire has diameter 0.5 mm and resistivity of 1.6 × 10–8 Ω m. What will be the length of this wire to make its resistance 10 Ω? How much does the resistance change if the diameter is doubled? When the diameter 'D' is doubled, the radius 'r' will become 2r and its area A' will increase by 4 times and will become 4A. Answer. Let us plot given values of Potential difference 'V' along Y-axis and that of current 'I' along X-axis. While plotting a graph with given corresponding values of V and I, we have found that approximately the same value for V/I = 3.33 (approx.) is obtained in each case. Thus the V–I graph is a straight line that passes through the origin of the graph, as shown in Fig., V/I is a constant ratio. A straight line plot shows that as the current through a wire increases, the potential difference across the wire increases linearly – this is Ohm’s law. Question 8. When a 12 V battery is connected across an unknown resistor, there is a current of 2.5 mA in the circuit. Find the value of the resistance of the resistor. Question 9. A battery of 9 V is connected in series with resistors of 0.2 Ω, 0.3 Ω, 0.4 Ω , 0.5 Ω and 12 Ω, respectively. How much current would flow through the 12 Ω resistor? Answer. When resistors are connected in series, the strength of current 'I' passing through each resistor is same. ∴ value of current passing through 12 Ω resistor as well others = 0.67 Ampere. Question 10. How many 176 Ω resistors (in parallel) are required to carry 5 A on a 220 V line? Question 11. 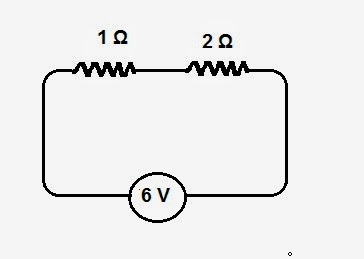 Show how you would connect three resistors, each of resistance 6 Ω, so that the combination has a resistance of (i) 9 Ω, (ii) 4 Ω. As shown, a parallel combination of two resistance is connected in series with the third resistance. 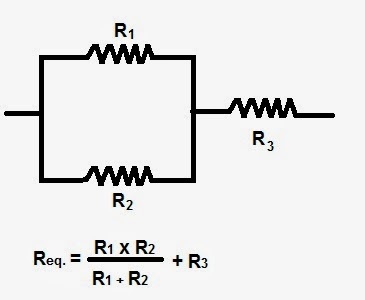 As shown, a series combination of two resistance is connected in parallel with the third resistance. Question 12. Several electric bulbs designed to be used on a 220 V electric supply line, are rated 10 W. How many lamps can be connected in parallel with each other across the two wires of 220 V line if the maximum allowable current is 5 A? Question 13. A hot plate of an electric oven connected to a 220 V line has two resistance coils A and B, each of 24 Ω resistance, which may be used separately, in series, or in parallel. What are the currents in the three cases? Question 14. Compare the power used in the 2 Ω resistor in each of the following circuits: (i) a 6 V battery in series with 1 Ω and 2 Ω resistors, and (ii) a 4 V battery in parallel with 12 Ω and 2 Ω resistors. Question 15. Two lamps, one rated 100 W at 220 V, and the other 60 W at 220 V, are connected in parallel to electric mains supply. What current is drawn from the line if the supply voltage is 220 V? 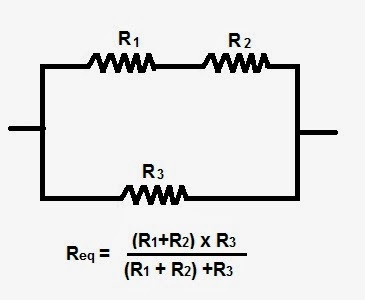 When R1 and R2 are connected in parallel, Let be REq equivalent resistance and I be current drawn through R1 and R2 connected in parallel. Question 16. Which uses more energy, a 250 W TV set in 1 hr, or a 1200 W toaster in 10 minutes? ∴ TV Set uses more power. Question 17. An electric heater of resistance 8 Ω draws 15 A from the service mains 2 hours. Calculate the rate at which heat is developed in the heater. ∴ Heat is developed at the rate of 1800 W or 1.8 KW or 1800 joule per sec. Question 18. Explain the following. (a) Tungsten offers high resistance against electric current and it has high melting point. Mainly for these two characteristics, Tungsten is used almost exclusively for filament of electric lamps. When the electric current flows through Tungsten filament, due to high resistance of Tungsten, it gets heated up to a very high temperature and starts glowing with light. High melting point of Tungsten prevents it from melting away at higher temperature. It can withstand high temperature due to high melting poin. (ii) directly proportional to resistance for a given current, and (iii) directly proportional to the time for which the current flows through the resistor. Higher resistance, high melting point and higher density of an alloy in conductors of electric heating devices, all to gather, help in producing a large amount of heat at higher temperature, at the same time offsetting any deformation arising out of temperature variations. Question 1.What does an electric circuit mean? Answer : An electrical circuit essentially consists of load devices, connected together by conducting material such as wire and electric power source. The naure of load devices, depending upon the application, may be either Resistive or Inductive or Capacitive . Question 2. Define the unit of current. Question 3.Calculate the number of electrons constituting one coulomb of charge. Question 1. Name a device that helps to maintain a potential difference across a conductor. Question 2. What is meant by saying that the potential difference between two points is 1 V? Question 3. How much energy is given to each coulomb of charge passing through a 6 V battery? Question 1. On what factors does the resistance of a conductor depend? Resistance of a uniform metallic conductor is inversely proportional to the area of cross-section (A). Different materials exhibit different amount of electrical resistivity. It is denoted by ρ (rho) and also know as constant of proportionality. Question 2. Will current flow more easily through a thick wire or a thin wire of the same material, when connected to the same source? Why? Question 3. Let the resistance of an electrical component remains constant while the potential difference across the two ends of the component decreases to half of its former value. What change will occur in the current through it? As the Resistance (R) is constant. Clearly, Resistance being constant, as potential difference decreases to half of its former value, the value of current (I) will also be reduced to half. Question 4.Why are coils of electric toasters and electric irons made of an alloy rather than a pure metal? (b) Silver is the best conductor of electric current because of its Electrical resistivity is 1.60 × 10–8 Ω m, which is least of all other metals.